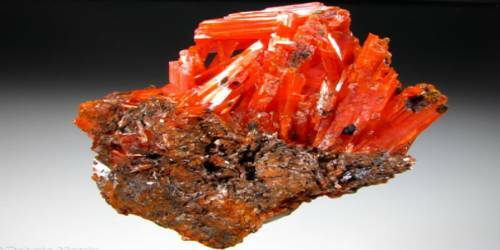 Crocoite is a mineral consisting of lead chromate, PbCrO4, and crystallizing in the monoclinic crystal system. It is a rare bright orange mineral consisting of lead chromate. It is identical in composition with the artificial product chrome yellow used as a paint pigment. Its main source of quality specimens comes from the Dundas District of Tasmania, Australia. The crystals there are usually long thin prisms. 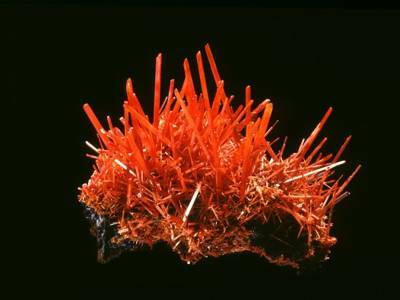 Crocoite is commonly found as large, well-developed prismatic adamantine crystals, although in many cases are poorly terminated. Crystals are of a bright hyacinth-red color, translucent, and have an adamantine to vitreous lustre. On exposure to UV light, some of the translucency and brilliancy is lost. The streak is orange-yellow; Mohs hardness is 2.5–3; and the specific gravity is 6.0. It was discovered at the Berezovskoe Au Deposit (Berezovsk Mines) near Ekaterinburg in the Urals in 1766; and named crocoise by F. S. Beudant in 1832, from the Greek κρόκος (krokos), saffron, in allusion to its color, a name first altered to crocoisite and afterward to crocoite. In the type locality, the crystals are found in gold-bearing quartz-veins traversing granite or gneiss and associated with crocoite are quartz, embreyite, phoenicochroite, and vauquelinite.